1. Using a manikin or mask, demonstrate CPR. Show how to place the patient in the recovery position and how to manage an unconscious person after an accident, fit, fainting or other causes. 2. Understand the dangers of moving or handling a patient when the extent of the injury is unknown. (b) how to dress a wound. 4. Know how to guard against shock following an accident and electric shock. 5. Show how to prevent and deal with hypothermia. 6. Demonstrate the first-aid treatment for burns, including those caused by acid and friction. 7. Bandage an injured ankle. 8. Know what to do if you suspect that someone has swallowed a poisonous substance. 9. Understand the limits of capability and importance of summoning help. 10. Know how to deal with a foreign body in the eye, ear, nose or throat. 11. Prepare a simple first aid kit for home or camp and know how to use the contents. 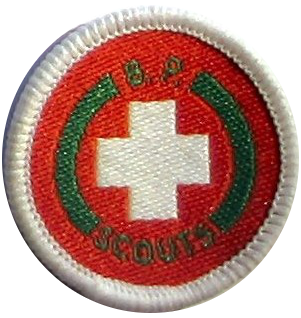 Note: A person holding either British Red Cross Youth First Aid, St Johns Ambulance Essentials of First Aid or St Andrews Ambulance Association Junior First Aid cert, automatically qualifies for this badge. The Examiner for this badge must be an Instructor in First Aid, or a Health Care Professional ie Nurse, Paramedic or Ambulance Technician.